See how else I've worn this top here. I've been feeling like I am running behind in everything lately! There is so much to think about and to do with moving all my speech therapy things to a new school and I am trying to make the most of my last two weekends of summer. We went to a fun zoo event on Friday night with another couple and their daughter and then spent Saturday at Irish Fest with my brother, his daughter, and girlfriend! Even though Milwaukee is very well known for all their festivals we don't make to many of them. So I am glad we had a chance to go to one of the festivals this summer and we had a lot of fun! Hope you all had a wonderful weekend as well! mint suits you well, love that bag. Your bag is amazing! Love the mint and sequin combo! I love that purse! It sounds like you had a fun weekend! Cute combo! Summer festivals are always fun. 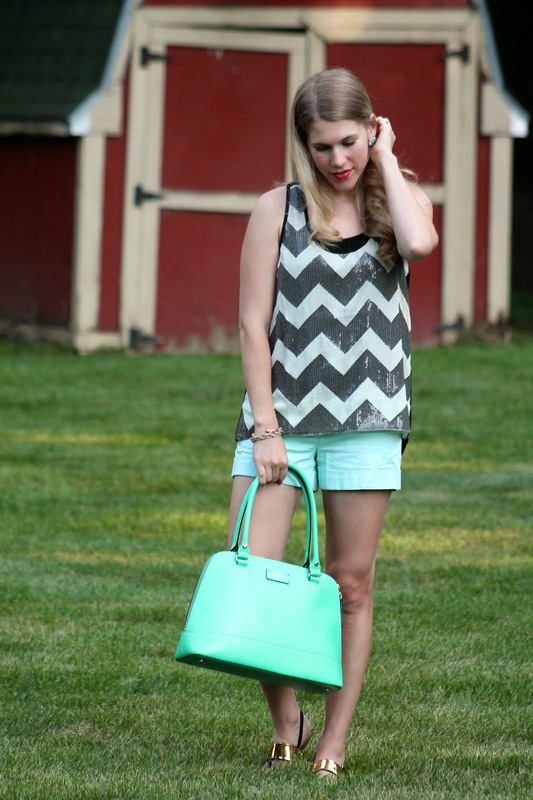 3 of my faves: chevron, sequins, and mint!! This top is adorable on you! I am really loving the mint too! Aww sounds like you are making your last couple weekends count! And looking fab--that mint purse is fab city! I LOVE that bag! Can't believe the school year is almost upon us. This summer has flown by! It looks like you've been trying to make the most of these last few weeks! Yay! We are twins, I love my kate spade mint bag! Love the mint with the gray in the top. I feel behind too! We just got back from my brother-in-law's wedding. I'm playing catch up everywhere. Good luck! I bet it has been crazy getting everything ready for your job switch! Enjoy your weekends! And I love the chevron with the mint! oh this is the cutest combo. I adore it Laura. Thanks for stopping by my blog again. 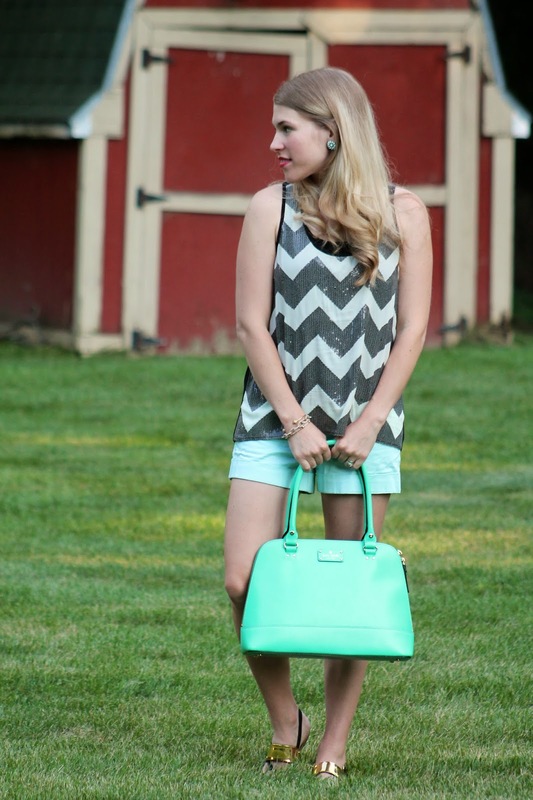 That chevron top is fabulous! Mint is such a versatile color for summer. Your pairing it with a black/white is surprising but beautiful. Well done! Ahh!! Your purse is just so gorgeous, I can't get over it. Perfection. I hope you're able to get everything done that you need to! I'm glad to hear you had some fun at the zoo though! Cute earrings!! I miss zoo a a la carte! Ahhhh this is such a cute look! I love the tank and the bag especially. Just found your blog through Whitney a la Mode and I love it! I love everything about this outfit- the mint is so gorgeous! I love this top every time you wear it! It looks really great with the mint! Omg your bag is so dreamy! Loving it!